Ukraine’s President Petro Poroshenko says a “roadmap” will be prepared to end fighting between troops and pro-Russian separatists in the east after meeting Russian President Vladimir Putin in Belarus. Vladimir Putin said Russia would assist a dialogue, but stopping the fighting was a matter for Ukraine itself. 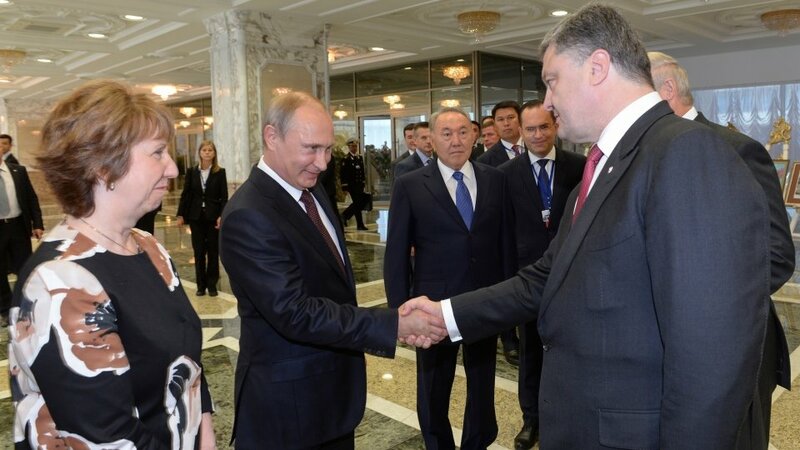 “A roadmap will be prepared in order to achieve, as soon as possible, a ceasefire regime which absolutely must be bilateral in character,” Petro Poroshenko said after two hours of direct talks with Vladimir Putin in Minsk. Earlier this year, Petro Poroshenko declared a unilateral ceasefire but accused the rebels of not following suit. Prior to their one-to-one meeting, Petro Poroshenko and Vladimir Putin also took part in discussions with the EU’s top diplomat Catherine Ashton. The summit came after 10 Russian soldiers were seized in Ukraine’s east. The two regions declared independence from Kiev following Russia’s annexation of the southern Crimean peninsula from Ukraine in March. However, he stressed that it was up to the government in Kiev and separatist leaders in the east to work out conditions for a truce. Petro Poroshenko and Vladimir Putin reportedly agreed to hold further consultations between Ukraine’s and Russia’s border guard agencies.